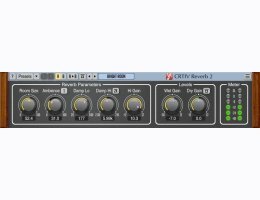 CRTIV Reverb is a stereo reverberation effect AAX, AU and VST plugin for professional music production applications. This reverb plug-in provides a wide palette of reverb spaces while requiring only a minimal effort to use. The tails created by this reverb are very dense and produce a well-defined spatialization. Since the reverb uses a kind of "true stereo" algorithm the panned sounds receive a good stereo field placement. - Added damping strength parameter. - Added self-modulation for improved depth perception and warmness. - Increased overall reverb's density. - Changed "Hi Gain" parameter's behavior so that it applies makeup gain. - Reduced clicking during room size changes. - Redesigned knobs and background texture.